It seems like Mozilla Firefox development team has tough hill to climb in order to beat Google in its own game, that’s rapid development cycle. 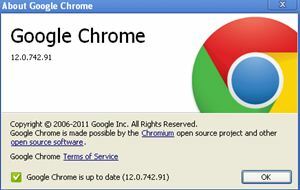 Google Chrome development team has worked hard to move their popular Google Chrome browser to stable version of 12. The latest stable version of Google Chrome 12 has included lot of new features, enhancements, security updates, improvements and increased stability, such as hardware accelerated 3D CSS and a new Safe Browsing feature. New safe browsing protection against downloading malicious files. Ability to delete Flash cookies from inside Chrome. Launch apps by name from the Omnibox. Integrated sync into new settings pages. New warning when hitting Command-Q on Mac. Chrome users who like to know further details of the security fixes been applied to Chrome 12 can refer to Chromium security page. Anyway, if your Google Chrome browser not yet upgraded to stable version (currently at version 12.0.742.91) then you can download from http://www.google.com/chrome or through the below direct download links for Google Chrome 12.0.742.91 for Windows, Linux and Mac platform.